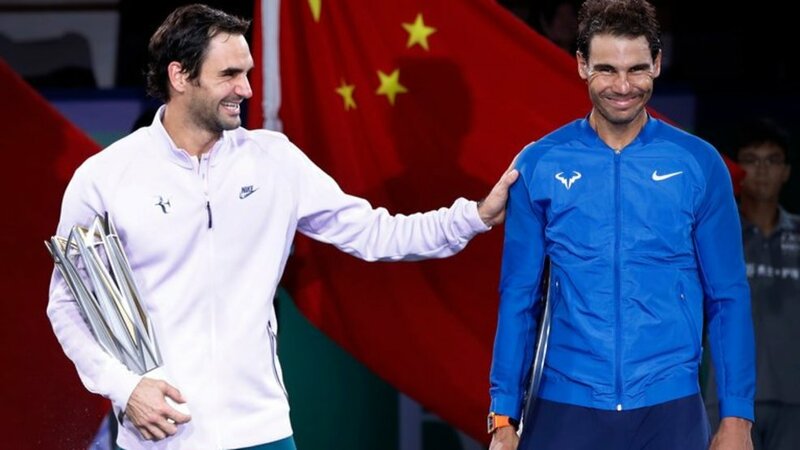 Boosters of Rafael Nadal believed that not having faced Roger Federer for more than six months would work in his favor when they collided in the final of the Shanghai Rolex Masters on Sunday. The Swiss Maestro had toppled the Spaniard three consecutive times earlier in 2017, making a spectacular comeback from 1-3 down in the fifth set of the Australian Open final to sweep five games in a row, taking apart his most revered rival 6-2, 6-3 in the round of 16 at Indian Wells, clipping Nadal 6-3, 6-4 in the final of Miami. But they did not meet on the clay court campaign dominated by Nadal, who secured a tenth French Open crown at Roland Garros; Federer wisely elected to rest and train during that stretch of the season rather than risk an injury or deal with Nadal on the dirt. They did not confront each other at Wimbledon, where Federer collected a record eighth title on the lawns at the All England Club; Nadal was ushered out of the world's premier tournament by a 34-year-old left hander from Luxembourg named Gilles Muller in the round of 16, falling 15-13 in the fifth set of that riveting skirmish. Moreover, the two titans had no showdown at the U.S. Open either. They were one match away from their first ever duel on the hard courts in New York, but Federer was ousted in the quarterfinals by Juan Martin del Potro, who subsequently bowed out against Nadal in the penultimate round. Nadal, of course, took the title in Arthur Ashe Stadium, capturing the Open for the third time. And then he was the winner in his first tournament after Flushing Meadows at Beijing the week before last. That set the stage for both men to move through the field for a final round encounter in Shanghai, and they did so convincingly on the fast hard courts in China. Nadal fans—well aware that he had won 16 matches in a row since last suffering a defeat against Nick Kyrgios in Cincinnati—were optimistic that this would be his day. Federer loyalists yearned to see their man reproduce the magic that had carried him past the Spaniard the last four times they had clashed, going back to 2015 in Basel. Neutral observers—followers of the sport who celebrate both men for their contrasting styles, classy conduct and enduring greatness—wanted more than anything to see the Shanghai meeting turn into a blockbuster. In the end, the people who cherish the 36-year-old Swiss stylist were rewarded beyond their expectations. Federer dissected Nadal 6-4, 6-3 with a consummate display of his shotmaking flair, free wheeling brilliance and completeness as a player. This was a virtuoso performance across the board from a champion who was in the zone. Federer captured not only his sixth singles title of a stellar 2017 campaign (he has played only ten events) but also the 94th championship of his career. The Swiss raised his match record for the year to 44-4 while Nadal currently stands at 65-10. Federer has moved into a tie for second place with Ivan Lendl in the Open Era among men's title holders, with Jimmy Connors standing alone at the top. Connors was the victor at 109 tournaments across his storied career. Can Federer move past the American southpaw by taking 16 more titles before he puts his racket aside and retires? If he plays on at a reasonably high level and is still entrenched among the top five in the world through 2020 (which I believe is entirely possible) Federer just might break the Connors record. He could easily win two or possibly three more tournaments this year. He should be good for five tournament victories in 2018. If this seemingly ageless fellow remains healthy, there is no reason he would not take four or five more crowns in 2019. That would put the Swiss within striking distance of Connors as he heads into 2020. He turns 39 that year, but I would not put it past him to win four or more tournaments that season, and perhaps put a few more tournament triumphs in his column the following year. So we will see what transpires. Of this much I am certain: he will at the very least conclude his career with 107 or 108 titles in his personal collection, and that would be an extraordinary feat. If he surpasses Connors, put that milestone down as just another feather in his cap. But let's not get ahead of ourselves. Why did Federer crush Nadal so comprehensively in Shanghai? How did he pull that off? What tools did he use to achieve his victory? It was a combination of factors that led to such a decisive triumph. He clearly peaked propitiously for this appointment. Having played only the Laver Cup team exhibition since the U.S. Open, Federer was entirely fresh and eager as he took on the challenge of competing against Nadal in Shanghai. Having beaten the Spaniard three times already this season, he seemed to take on this assignment as if he had absolutely nothing to lose. Conversely, Nadal was playing his tenth match in a twelve-day span over a taxing fortnight. He wore a bandage below his right knee, which he has not done for quite some time. The match was contested under the roof with rain falling outside, and Federer has always been the decidedly better player in those conditions. And the hard court in Shanghai was lightening fast. Day by day, match by match, the court got quicker and quicker. The outcome of the 38th meeting between the two icons was determined to some extent in the very first game of the contest. Nadal served first, and fell into immediate difficulties. On the opening point of the match, he drove an inside out forehand wide. A highly charged yet characteristically calm Federer then angled his return acutely, and Nadal went down the line off the forehand. His shot was struck well, but Federer chased it down ably and flicked a running forehand crosscourt for an outright winner: 0-30. Nadal took the next point, but soon fell behind 15-40 as Federer's deep return drew an errant backhand crosscourt from the Spaniard. All week long, Nadal had been magnificent off the backhand, making that identical play over and over again, taking his two-hander early, angling it away brilliantly into open spaces. But this time he pulled it wide: 15-40. From double break point down, Nadal found an unmistakable spark. A first serve set up a forehand winner for 30-40, and then he aced the No. 2 seed down the T to make it deuce. But Federer seized control of the next point, outmaneuvering Nadal completely, concluding the exchange with a winning backhand crosscourt that clipped the baseline in the corner off a short backhand down the line from his opponent. At break point down, Nadal's first serve to the backhand was well executed, eliciting a short return from the Swiss. Nadal's approached crosscourt off the forehand, but the approach was not forceful enough and Federer anticipated that shot, driving a winning passing shot majestically down the line off the backhand. It was reminiscent of a match point for Nadal in the fourth set tie-break of the epic 2008 Wimbledon final that lasted five glorious sets. Federer came up with a winner then as well, although he eventually was bested 9-7 in the fifth set by the indefatigable left-hander. So Federer was off and running in Shanghai with the swift service break for 1-0, and in many ways he never looked back. Connecting on four out of five first serves, releasing one ace, looking thoroughly relaxed, Federer held at 15 for 2-0. Nadal advanced to 30-0 in the third game, dropped the next two points, but moved to 40-30 as Federer netted a backhand crosscourt aggressively. Had it cleared the net, it would almost surely have been a winner. A neatly executed body serve coaxed an errant forehand return from Federer at 40-30, and so the Spaniard was on the scoreboard, trailing 2-1. Federer, however, fully believed in himself and plainly sensed his opponent's vulnerability. Serving in the fourth game, he took an impeccably played backhand crosscourt from Nadal that landed inches from the baseline and laced a forehand winner sharply crosscourt. That gave Federer a 30-15 lead. He held at 30 for 3-1 with a service winner down the T, provoking a backhand return error in the net from an outstretched Nadal. On his way to a hold at 30 for 2-3, Nadal served a pair of aces down the T, but an implacable Federer marched on to 4-2 in an elegant love hold, releasing four consecutive aces, three down the T and one out wide. Serving at 30-15 in the following game, Nadal sent a forehand down the line long off a backhand slice from Federer. The Spaniard was displeased with that unjustifiable error, but he went to 40-30 by getting excellent depth off the backhand and drawing an error off the forehand from Federer. At 40-30, Nadal aced Federer out wide, holding on for 3-4. Yet Federer remained on song and in the groove. He opened the eighth game with an ace down the T, his sixth of the set. A penetrating inside out forehand paved the way for Federer to release a forehand inside in that was out of reach for a beleaguered Nadal: 30-0. A wide serve created an avenue for a forehand inside out winner, lifting Federer to 40-0. Nadal found the range with a forehand down the line return winner, but Federer held at 15 with a service winner down the T that was too much for Nadal on the forehand side. Federer had moved to 5-3. Nadal held at love in the ninth game with an ace out wide, but Federer served out the set regally, holding at love, commencing that game with an inside out forehand winner, closing it out with an ace down the T. Set to Federer, 6-4. In five service games, he had swept 20 of 24 points. Although Nadal made only three of six first serves in the opening game of the second set, he nevertheless played a remarkable game to hold at 30 for 1-0. Federer twice connected on forehand down the line winners, but, at 40-30, the Spaniard drilled a backhand crosscourt that Federer could not answer with a running forehand. His shot found the net. 1-0 for Nadal. Now the 31-year-old world No. 1 moved farther back on the return of serve, but the strategic shift was unsuccessful. Federer varied his tactics while maintaining his pressure on his opponent. At 15-0, his neatly packaged serve-and-volley was too much for Nadal, who netted a backhand pass under duress. Federer would hold at 15 for 1-1 as a frustrated Nadal missed a backhand down the line. The Spaniard was beginning to press. Federer was supremely confident, and Nadal did not have his customary vigor and deep inner belief. The combination was leading inexorably toward a one-sided outcome. Nonetheless, Nadal held at love for 2-1 with a deep second serve to the backhand causing a mistake from Federer on the return, a backhand crosscourt taken early that was unmanageable for Federer, and two first serves coaxing Federer into backhand return errors. With that love hold, Nadal advanced to 2-1. With Federer serving in the fourth game, the Swiss aced the Spaniard for 30-15, but Nadal took the next point. His crosscourt backhand was struck forcefully, drawing a mistake from Federer. It was 30-30 on the Federer serve for the first and only time in the match. He met the moment boldly, serving-and-volleying cagily, placing his delivery out wide, opening the court for a backhand first volley winner. At 40-30, Federer's second serve was unremarkable, but Nadal bungled a forehand crosscourt return that landed barely wide. Now it was 2-2. Down 15-30 in the fifth game, Nadal profited from a rare tactical error from Federer, who came in off the forehand from too deep a position. Nadal's forehand down the line pass was low and gave Federer no chance on the volley. It was 30-30. An unstoppable first serve propelled Nadal to 40-30. He followed with a first serve wide to the backhand, but Federer moved to cover that angle an instant before Nadal made contact. The topspin return from Federer was hit sweetly down the line, and Nadal had to counter from behind the baseline with a backhand slice. Federer clocked his forehand inside out to get Nadal on the run, and then stepped in with full conviction, coming over the backhand for a winner down the line. At deuce, Nadal tried to approach off Federer's low forehand return crosscourt, but netted his backhand badly. A superb first serve down the T that Federer hardly touched took Nadal back to deuce, but Federer garnered a second break point by attacking off the forehand, setting up a backhand drop volley winner on the stretch off a low forehand pass. That was sublime. Now the two competitors engaged in an uncommonly long rally on this particular day. On the thirteenth stroke of that exchange, Nadal pulled a backhand crosscourt wide. This unforced error was very expensive. Federer was up a set and a break, leading 3-2 in the second set. The first point of the following game was demoralizing for Nadal. He directed his backhand second serve return with good depth down the line. Federer somehow managed to flick a backhand crosscourt that landed inside the service line at a sharp angle. Nadal had no way to get there. That startling winner gave Federer a 15-0 lead. He serve-volleyed his way to 30-0. Nadal missed on a second serve return off the backhand and then sent a forehand first serve return long. Federer had marched to 4-2 without losing a point on serve. Victory was clearly in his vision. Nadal held on at 30 for 3-4 with a nifty backhand drop volley winner, but Federer was flowing so freely on serve that Nadal was making absolutely no impression. Federer commenced the eighth game with an ace down the T, serve-volleyed to lure Nadal into a forehand return error, and aced Nadal down the T for 40-0. Nadal took the next point but Federer gained the easy hold at 15 for 5-3 by releasing a stinging backhand down the line. Nadal attempted a backhand down the line of his own but his shot flew long. Federer was one game away from victory. Serving to stay in the match in the ninth game, Nadal felt the heat of his opponent's game immediately. A backhand return to the Nadal forehand got Federer on top of the point. He followed with a deep crosscourt forehand that Nadal could only slice back meekly off the backhand. Federer moved forward and went behind Nadal for a forehand crosscourt winner. At 0-15, Federer's forehand return drew a backhand long from Nadal, who was now contributing to his own demise with unprovoked mistakes. Another one followed. Retreating for an overhead off a deep lob that he would handle comfortably under ordinary circumstances with his excellent overhead, Nadal sent his smash into the net to make it 0-40. He saved one match point for 15-40 but made an unforced error off the forehand at 15-40 to drop his serve timidly for the second time in the set and the third time in the match. The battle was over. Federer was unbreakable. Not once was he even taken to deuce on his delivery. He won 83% of his first serve points (25 of 30), and an astounding 79% on second serve (11 of 14). Nadal's numbers were dismal by comparison; he won only 62% of his first serve points and 50% on his second delivery. And so Federer picked up his first title since Wimbledon, and his sixth of a very productive season. His win over Nadal was a reaffirmation for him that these days he has the capacity to not only defeat Nadal on surfaces other than clay, but he can do it decisively. In his last three matches against the Spaniard, he has not been broken. His five-match winning streak against Nadal is astonishing in light of the fact that the Spaniard was ahead in their rivalry 23-10 as recently as the autumn of 2015. Now they stand at 23-15. Three times over the years Nadal had managed to cast aside his towering rival in five consecutive clashes, but never until this year had Nadal lost to Federer more than two times in a row. Their rivalry began in 2004. It is entirely possible that Federer could beat Nadal a few more times this year since their three remaining tournaments—Basel, Paris and the ATP Finals in London—are all indoors. Can Federer eventually finish ahead of Nadal in their illustrious series? I doubt it, but if he stays away from clay court tournaments for the remainder of his career as he did this season, he could make it close. Nadal holds a commanding 13-2 lead in his career clay court series with Federer; elsewhere, Federer is now in front 13-10. In any case, Federer's path to the Shanghai final was essentially straightforward. He opened against the diminutive Diego Schwartzman, downing the 5'7" dynamo from Argentina 7-6 (4), 6-4. He dismissed Alexandr Dolgopolov 6-4, 6-2 and then stopped Richard Gasquet 7-5, 6-4. Federer served well in all of his matches but the rest of his game was slightly below par. And then he came from behind in the semifinals to oust del Potro, avenging his loss to the big man at the U.S. Open with a 3-6, 6-3, 6-3 victory. Del Potro had toppled No. 3 seed Alexander Zverev in the round of 16 but had injured his left wrist in the final set of his quarterfinal triumph over Viktor Troicki, suffering a contusion. Despite that issue, del Potro was blazing at the outset of his contest with Federer, serving eight aces in taking the opening set. At 2-3 in the second set, he battled ferociously to stay on serve. That sixth game lasted seven deuces. Del Potro had three game points, fought off four break points, but Federer got him on the fifth opportunity, taking a 4-2 lead. He took his place in the final with a hard-earned win. Nadal was tested seriously after an excellent start to the tournament. He obliterated the American Jared Donaldson 6-2, 6-1 and handled the Italian Fabio Fognini 6-3, 6-1. The court was playing slightly slower then. In the quarters, he faced Grigor Dimitrov for the second week in a row. As was the case in Beijing, the 26-year-old Bulgarian pushed the Spaniard to three hard sets. In Shanghai, Nadal took the first set with one timely service break at 4-4. In the second set, he led 4-2 in the tie-break but netted an inside out forehand off a backhand slice from Dimitrov. Later, serving at 4-5, he bungled another forehand. Dimitrov took the tie-break 7-4 but Nadal was utterly disciplined and determined in the third. Nadal got the one break he needed in the final set and came through 6-4, 6-7 (4), 6-3 without losing his serve, but the top seed should have been off the court about forty minutes sooner. One round later, confronting Marin Cilic in the semifinals in another high caliber encounter, Nadal escaped from 4-5, 15-40 in the opening set with some clutch play. He saved the two set points there and another later in the game before holding for 5-5. Nadal took that set 7-5 and was up 3-2, 30-0 in the second set before making four consecutive unforced errors. After three forehand mistakes in a row, he netted a forehand drop volley by not bending as low as he usually does. Cilic was allowed back to 3-3. Nadal broke again and served for the match at 5-4. Once more, he did not put the clamps down. Nadal had a match point in that tenth game. Cilic, who played some of his most inspired tennis of the season, hit a crosscourt return off the backhand with good pace. Nadal tried to respond with a down the line forehand but missed flagrantly. Cilic played two spectacular points in a row to break back for 5-5. They proceeded to a tie-break and Nadal was largely unerring in that sequence. He won this gripping match 7-5, 7-6 (3), but it was hard fought and very physical, perhaps weakening Nadal slightly for the final. Now we head into the homestretch of the season, with Nadal ahead of Federer by 1960 points in the Race to London. He is determined to close this year as the No. 1 ranked man in the world of tennis, to finish atop the Emirates ATP Rankings for the fourth time in his career. He first resided in that spot back in 2008, and returned to the top in 2010 and 2013. No one has ever been ranked No. 1 among the men after such a long gap between first and last years (nine). If Federer managed to wrestle that ranking away from his old rival, it would be no fewer than 13 years since he first finished a season as the best player in the world. Either way, a significant record will be set. Nadal will head into the eight man ATP Finals in London still stationed at the top, but he needs to maintain a healthy lead of 1000 points or more going into that event. Federer will be the clear favorite to win that season-ending tournament for the seventh time. Nadal may not need to win the tournament to hold on to his No. 1 ranking. But his status as the best would be questioned in some quarters by his dismal losing record against Federer. Conversely, Federer's critics will contend that he chose to skip the clay court circuit and not only protected his body but also deliberately stayed clear of Nadal on the dirt. Nadal must keep his eye on the prize and continue amassing ranking points from now until the end of the year. It will be critical for him that his knee holds up and allows him to play without any physical danger for the remainder of the season. Federer, meanwhile, seems to be targeting London as a primary goal. That is very bad news for the rest of the field.